It’s been a while since we’ve had a long term test vehicle at the Winding Road offices, so we thought we’d reintroduce the idea with something special. No doubt you’ve read our review of the Hellcat coupe from our stint behind the wheel in Portland last summer and our notes from wet track driving from earlier this year, but now we’ll have the opportunity to see what the 707 horsepower muscle coupe is like to live with year-round. Well, almost year-round. 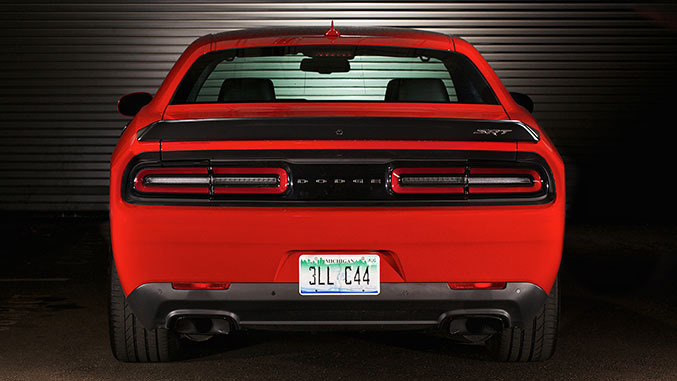 We've got this bright red bruiser in our garage for six months, so come December the folks from Dodge are under the impression that they’ll be getting the car back. We’ll see about that. Regardless, that gives us enough time to live with the most hellacious of Challengers through a Los Angeles summer, fall, and into what many hope will be a rain-filled winter season. Dodge was kind enough to let us spec out the car that was to be built, so we thought we’d do our own riff on the “hero car” that the company used to introduce the world to the idea of a 707 horsepower muscle car. Accordingly, we opted for the TorRed paint hue, the 20 x 9.5-inch forged aluminum wheels with the bronze finish treatment (aka the “Brass Monkey” wheels), and the only exterior element that deviates from the aforementioned example - the satin black hood. There’s another reason we chose that particular exterior color scheme: Not only do these elements compliment the by-default matte black pieces like the fuel filler cap, aero bits and other accents, but since Dodge also offers the Black and Ruby Red interior color scheme as a no-cost option, it gave us the ability to really scratch that itch for continuity throughout the car, extending the exterior theme inside as well. As you may have noted from the photo above, our tester is outfitted with the Tremec 6-speed manual gearbox. This is by no means a knock against the new optional 8-speed ZF automatic – the heavy-duty 8HP90 is one of the most advanced automatic gearboxes available today and suits the power of the motor quite well. Truth be told, we just dig the old school vibe. Moreover, this gearbox and clutch combination comes straight from the Viper parts bin so it comes as little surprise that the Tremec is a great piece of hardware in its own right for those that prefer to row their own like we do. Aside from the blacked-out hood (which rang up $995 on the sticker) and wheel treatment, there’s only three optional items we chose on top of the car’s standard lineup of features: The wider and grippier 275/40ZR20 Pirelli Pzero tires ($395), the Uconnect system with the 8.4-inch touchscreen display with Bluetooth, satellite radio and navigation functions ($695) and red seatbelts ($95). Once we’ve finished fawning over our good fortune, the plan is to approach this long-term test a little differently from the typical format. In in the span of six months (and with one driver at the helm for the vast majority of the time), it’s unlikely we’ll run into much in the way of maintenance issues - though we’ll certainly note those if we do. Instead, we’ll focus on some of the aspects that make this particular car interesting – its versatility and sheer scope of performance. 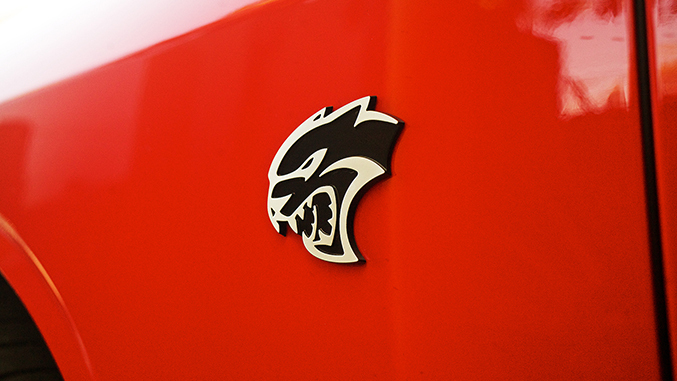 For many potential Hellcat buyers, this is their first exposure to automotive performance at this level – in terms of sheer thrust, this kind of moxie was formally exclusive to six-figure supercars. That’s no longer the case, but are we giving anything up in the process? To answer that, not only are we going to revisit Auto Club Dragway in Fontana this summer to see how the car fares with dry tarmac to use and hot track temperatures to contend with, but we’ll also be taking the car on a road trip outing with a full complement of passengers and gear to see if this beefed up coupe still excels as a grand touring machine and family hauler as well. Of course, we'll also be commuting through daily Los Angeles traffic to see if we’ll end up regretting that third pedal, and (assuming it ever rains in Southern California again) getting a feel for what 700 ponies is like to contend with in inclement weather. In the meantime, we’re perfectly happy to enjoy a California summer with this immensely entertaining-to-drive vehicle. Expect to see a lot more of this car in the coming months. + WR Long Term Garage Update: Does The Challenger Hellcat Still Do Grand Touring?